Vishwaroopam 2 movie review and release highlights: Here's what celebrities, critics and fans have to say about Vishwaroopam 2, starring Kamal Haasan, Pooja Kumar and Andrea Jeremiah among others. Vishwaroopam 2 movie review and release highlights: Vishwaroopam 2 is the sequel to Kamal Haasan’s 2013 film Vishwaroopam. Actor-director Kamal Haasan’s Vishwaroopam 2 has finally hit screens. Kamal will once again play the character of RAW agent Wisam Ahmed Kashmir. Alongside Kamal, the film also stars Waheeda Rehman, Rahul Bose, Shekhar Kapur, and Andrea Jeremiah in pivotal roles. Vishwaroopam 2 is Kamal Haasan’s first release after his announcement of joining active politics. The film also boasts of some great action sequences but it is yet to be seen how it will impress the audience who is yet to get over Tom Cruise’s death-defying stunts in Mission: Impossible – Fallout. Along with Tamil, the film will also be released in Telugu and Hindi on August 10. Read all the updates about Vishwaroopam 2, starring Kamal Haasan, Rahul Bose, Pooja Kumar, Andrea Jeremiah, Shekhar Kapur, Jaideep Ahlawat and Waheeda Rehman among others. Read the updates in Tamil. The Indian Express' film critic Shubhra Gupta wrote in her review of the Kamal Haasan starrer, "The plot is choppy, carelessly hopping continents (India, US, Afghanistan) and time zones. When the characters—spooks and traitors, forgetful mothers and sentimental sons, and pretty women making up to the great spymaster— are not killing each other, either via hand-to-hand combat, knives and guns, they are busy flitting about in all manner of transport and deploying weapons. Helicopters are whirring away, missiles are being launched, grenades are being flung, and Vis, armed and dangerous, is on top of everything, saving India’s capital from being bombed out of existence." Here is another beautiful promo from Kamal Haasan's Vishwaroopam 2. Saadhi Madham song teaser gives us the glimpse of the budding romance between army recruit Ashmita Subramaniam (Andrea Jeremiah) and Major Wisam Ahmad Kashmiri (Kamal) during their time at the military academy. In Ghibran's compositions, the song is sung by Andrea Jeremiah and Sathya Prakash. The romantic number is written by Kamal himself. Here is the promo of Naanaagiya Nadhimoolamae song from Vishwaroopam 2 featuring Kamal Haasan, Pooja Kumar, and legendary Waheeda Rehman. The melody is a son's tribute to his mother. Apart from writing the song, Kamal Haasan has also sung it along with Kaushik Chakraborty, Master Karthik, Suresh Iyer. In an interview with the Film Companion, the superstar had revealed that while people expect the actor to do things that are timeless, the Vishwaroopam movies were delayed by a period of 30 years. “They say I generally do things ahead of time, but Vishwaroopam is late by thirty years. I am sure people would have seen this film thirty years back. We would have had to explain the nuances and probably make it a tad more elaborate, that’s all,” the actor had said. Vishwaroopam was more than a blockbuster in Kamal Haasan’s career. After it was banned by the then Jayalalitha government in Tamil Nadu, the controversy snowballed into a national debate about the freedom of expression. This episode that was filled with high-voltage political drama even prompted Kamal to declare that he was contemplating to leave the state in search of a secular place to live. Vishwaroopam 2: The Hindi version of the film was given 14 cuts whereas the Tamil version was given 22 cuts. Words like 'Pakistan', 'Allah', etc have been muted in the film. Vishal tweeted, "Wishin great success n box office no.s 2 our dearest legend @ikamalhaasan sir all da very best for #Viswaroopam2. And my very own bro @thisisysr. All da best darling for ya maiden prod.it will rock.best wishes @iamharishkalyan n team.god bless"
In an interview with indianexpress.com, Kamal Haasan said, "I have always given a political message through my films. I have always dared to make politically relevant films. Making political comments and mimicry is satire, but I have gone beyond that. I have made a point of view that I strongly felt as a citizen and as an artiste. To sensitise my audience, I have done things that were necessary. This I have been doing since the time of Thevar Magan. Apoorva Sagodharargal doesn’t fall in this category. But if you watch some of my films like Thevar Magan, Mahanadi, Hey Ram, Virumandi, Dasavathaaram, there is a geo-political thriller attitude showcased. It is a direct impartation of what I felt is troubling me globally." Twitter user Vikram said, "#Vishwaroopam2 - The Underwater Sequence is there for a good amount of time and will be remembered in Tamil Cinema History as it is the first if its kind. Very new and different to Tamil Cinema. Again, @ikamalhaasan raises Kollywood's Standards 👏"
Twitter user Anees said, "Whoa! Done watching #Vishwaroopam2 The movie is pure CLASS. @ikamalhaasan rocks. The plot is neatly done with stunt sequences, story, romance, dialogues, screenplay all knit together! Massive hit on the way 🔥 VERA LEVEL! Kudos to @PoojaKumarNY @RKFI @Aascars 👍 A Block Buster." Twitter user Sridevi Sreedhar tweeted, "#Vishwaroopam2 First half report in one word - awestruck! @ikamalhaasan rocks. Technically on par with Hollywood films. Top class Action scenes"
Twitter user Vasu said, "#Vishwaroopam2 another episode In RAW agent life .. highly detailed and engaging with subtle humor spiced up here and there .. good first half 🙏🙏". He further tweeted, "#Vishwaroopam2 second half middling fare with sentiments and old revenge saga without much story to tell .."
Filmmaker Venkat Prabhu tweeted, "And waiting to get @ikamalhaasan dharisanam!!! #vishwaroopam2 🙏🏽🙏🏽 I am sure it’s gonna be treat to us fans!!! All da best team!!!" 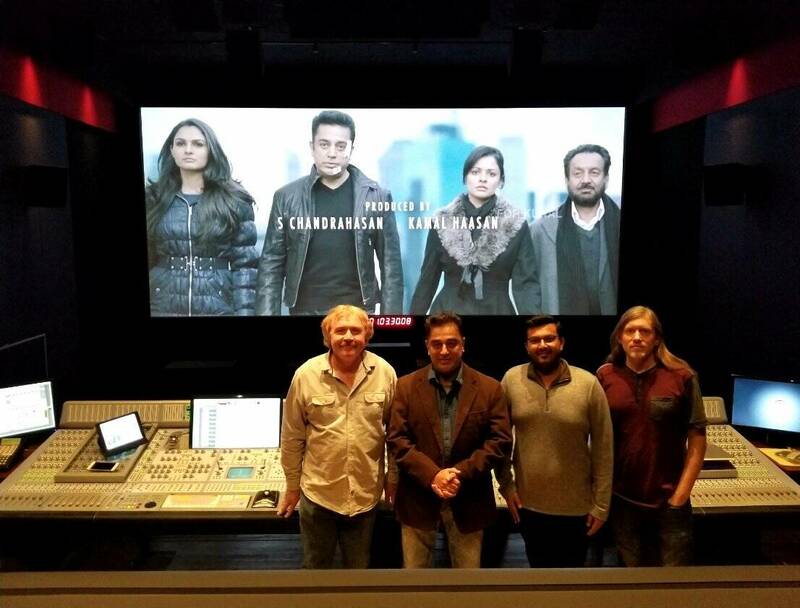 Sound designer Kunal Rajan tweeted, "#Vishwaroopam2 finally releasing today! What an unbelievable journey it has been with @ikamalhaasan since part 1 of #Vishwaroopam. Hoping this is not a good bye to Cinema for you Sir. Thank you for everything. Working with you has been one of the best experiences of my career!" Trade analyst Ramesh Bala tweeted, "#Vishwaroopam2 1st Half: The movie travels back and forth in time.. Prequel & sequel.. From NYC to UK to Chennai's OTA to Afghanistan.. One thing is sure.. Engaging.. @ikamalhaasan in top form.. His verbal duel with #AnandMahadevan - Lot of applause in theatre.. Action 👌"
The Indian Express critic Shubhra Gupta writes, "Even Kamal Haasan can’t rise above the shockingly inept script, which he rescues only in a few places, when his trademark intelligent, wry self-awareness manages to kick in. The rest can be safely ignored." Kamal Haasan shared his thoughts on sequels with IANS, "I thought of sequels long time back. So much before that people thought I was an eccentric and a dangerous person to deal with… in the sense… I wanted a sequel to Ek Duuje Ke Liye. And Balachander asked, ‘How do you make a film after Ek Duuje Ke Liye?' So I told my boss, my mentor, the story." Andrea Jeremiah shared her experience of working with Kamal Haasan with IANS and said, "I do not feel intimidated by actors or stars because I was never exposed to films widely. In Vishwaroopam 2, though I have worked with Kamal sir, I did not feel the pressure because I did not grow up watching his films. So it was never that I grew up admiring someone who I was finally sharing screen space with." While a major portion of Vishwaroopam 2 was completed during the making of part one, it took about five years for it to see the light of day. Some say it was due to political pressure, others blame financial problems of the producer. Here is a look back at the status of key characters of Vishwaroopam. Trade analyst Girish Johar told indianexpress.com, "Vishwaroopam 2 might have a difficult weekend in the South. Following the death of M Karunanidhi, it is difficult to say anything about the film’s earnings there, but in the Hindi belt, it will earn something between Rs 2-2.5 crore on its opening day." Trade analyst Ramesh Bala tweeted, "#Vishwaroopam2 starts with @ikamalhaasan 's historic #Vishwaroopam Eldams Road speech and #MNM inauguration and meetings.."
"My uncle worked for the intelligence, so it’s a topic close to my heart. Shekhar Kapur’s character in Vishwaroop is named after him. I have always been intrigued by what I thought is a direct contrast between popular spy stories and real-life events — because it’s not all about ticking time-bombs. I have been featuring RAW as a premise since the ’80s when I produced, wrote and acted in Vikram (1986), which was about the making of an inter-continental ballistic missile," Kamal Haasan told The Indian Express. In an interview with The Indian Express, Kamal Haasan said, "About the time I made Dasavathaaram (2008), I also got interested in geopolitics, and I wanted to bring that element into an entertaining movie. That’s what I did in Vishwaroopam. For example, people make fun of Mahatma Gandhi’s Khilafat Movement and raise questions such as when you are fighting for freedom in India, why do you care about someone else in Turkey? (The movement started as a protest against the British by Indian Muslims who didn’t want the Ottoman Caliphate to be abolished). But, the fact remains that the world is connected. So, the cases of espionage elsewhere in the world or Hamas being bombed are also connected to us. We just don’t realise the butterfly effect these international events can have." Kamal Haasan has been zipping all over the country promoting his most-delayed film Vishwaroopam 2. The sequel to 2013 spy thriller was originally planned to release in the same year as its predecessor. However, the movie was forced to languish in post-production hell for about five years owing to various reasons.